When Exactly Did The Church Begin? When did the Church actually begin? Undoubtedly, we have heard different answers to this important question throughout the years. Was it the moment the Roman soldier’s lance pierced Christ’s side and blood and water flowed out and spilled upon the ground on Calvary? Was it the result of the “…happy fault, O truly necessary sin of Adam, destroyed completely by the death of Christ” when, shortly thereafter, “Christ broke the prison bars of death and rose victorious from the underworld” (from the Exsultet)? Or was it when the Holy Spirit descended upon the apostles at Pentecost, strengthening and convicting them to go out and preach the Gospel to all nations? Scripture, Tradition and the Teaching Authority of the Church provide some disparate, yet provocative answers. The language in both Lumen Gentium and the Catechism of the Catholic Church is quite clear: The Church is born primarily of Christ’s total self-giving for our salvation, anticipated (my emphasis) in the institution of the Eucharist and fulfilled on the cross. “The origin and growth of the Church are symbolized by the blood and water which flowed from the open side of the crucified Jesus” (Lumen Gentium 3; cf Jn 19: 34). “For it was from the side of Christ as He slept the sleep of death upon the cross that there came forth the wondrous sacrament of the whole Church” (CCC 766). Given the fact that salvation history must trace its roots to Adam and Eve and their original sin in Genesis, and since the Old Testament in so many instances prefigures the New Testament typologically, the Church can, arguably, find her beginning “In the beginning…” (Gn 1: 1) when the original sin of our first parents necessitated a need for salvation, and therefore, a Savior. 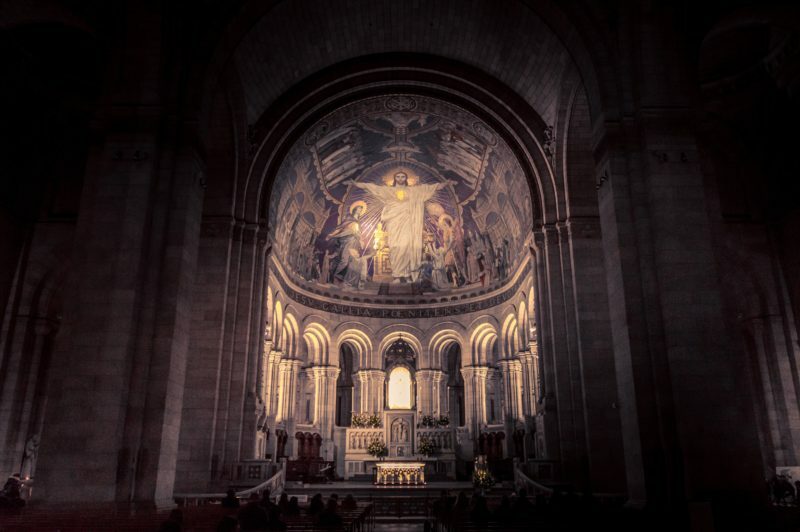 We recognize the Church Triumphant, the Church Suffering and the Church Militant – One Church – includes members from the time of Adam and Eve and down through the ages, from among anyone who ever lived, the living and everyone who ever will live. And what of the covenants established between God and man through Adam, Noah, Moses, Abraham and David and their influence on the Church? Because the Church, according to the Creed, is One, Holy, Catholic and Apostolic, an argument can be made for identifying the very beginning of the Church to the moment when Jesus’s words to Simon Peter in Matthew’s gospel first mention the concept? : “And so I say to you, you are Peter, and upon this rock I will build my church…and whatever you loose on earth shall be loosed in heaven” (Mt 16: 18-19). It is only in Matthew’s gospel where the Greek word ekklesia (Church) exists (see also Mt 18: 17) among the four gospel writers. The answer(s) to this question is/are left in a somewhat nebulous framework. By virtue of the fact that the word will is used by Christ in the context of the future tense, this reference to Peter in St. Matthew’s 16th chapter may suggest Peter’s primacy has yet to be established. Further evidence of this quite possibly exists in Luke’s gospel when Jesus tells Peter, “…but I have prayed that your own faith may not fail; and once you have turned back, you must strengthen your brothers” (Lk 22: 32), perhaps indicating Peter’s denial of Christ three times during His passion before reassuring Him of his love for Him three times after His resurrection, implicitly commissioning his leadership role among the apostles. The very first section of the Catechism – more than 25% of the entire text – highlights and examines the importance of the Creed in The Profession of Faith, where the idea of unbroken apostolic succession between today’s bishops and Christ’s twelve apostles is reiterated: “…the bishops have by divine institution taken the place of the apostles as pastors of the Church, in such wise that whoever listens to them is listening to Christ and whoever despises them despises Christ and him who sent Christ (CCC 862). These words are derived from Luke’s gospel: “Whoever listens to you listens to me. Whoever rejects you rejects me. And whoever rejects me rejects the one who sent me” (Lk 10: 16). Therefore, the Church does not and cannot exist without the twelve apostles (with Peter as the first and foremost apostle appointed directly by Christ Himself) and their legitimate successors, the bishops. The CCC supports this assertion: “The whole Church is apostolic…” (CCC 863). So when asking the question, “Where is the Church?” do we point to the physical building? Is the appropriate answer to the question found in the people who make up the Mystical Body of Christ? Perhaps a more complete apostolic answer is to locate the bishop, for where the bishop is, there is the Church. The eventual announcement of Peter’s primacy (important as it is), suggested by Christ’s use of the word will, is a precursor to the actual establishment of the Church. Before building His Church on Peter, Christ must first undergo His passion, death and resurrection – the Paschal Mystery – in order to establish His Church – the Mystical Body of Christ. Without the Paschal Mystery, there is nothing to build on Peter. Christ established the Church to save mankind from sin – including Adam and Eve – since the moment of their transgression in the Garden of Eden. Yet even before the Annunciation, the Second Person of the Holy Trinity – the Eternal Word – always existed and exists as the Alpha and the Omega, without beginning or end. Can the same be said of the Church, always in existence outside the boundaries of time and space? Pope Benedict XVI said, “…Christ, Who established the Church on the foundation of the Apostles closely around Peter, has also given it the gift of His Spirit, so that throughout the centuries he would be the comfort (Jn 14: 16) and the guide to the entire truth” (Jn 16: 13) (Pentecost May 15, 2005). He also said, “On the day of Pentecost, the Holy Spirit descended with power upon the Apostles; thus began the mission of the Church in the world” (Pentecost June 4, 2006). So this begs the question: Is the beginning of the Church herself separate and distinct from either the origin and growth of the Church or the beginning of the mission of the Church? Are they one and the same? The first mark of the Church has to do with her quality of being One. Christ established One Church with a unique and unified belief system (Eph. 4: 4-5), not separate churches with differing and contradicting belief systems (Keating 1996). * So when did the One Church begin? In Eden? With the apostolic commissioning of Peter? With the soldier piercing Christ’s side with a lance? At Christ’s resurrection from the dead? At Pentecost? The Sacred Triduum of Holy Week may give us some insight into the establishment of Christ’s Church. Holy Thursday through Easter is, essentially, celebrated as one liturgy. So, for example, the Last Supper contributes significantly to the beginning of the Church. Without Christ’s sacrifice on the cross, there is no Mass, and therefore, no Mystical Body of Christ. Without His passion, death and resurrection, there is nothing to either commemorate or celebrate. The beginning of the Church, then, while it may not be clearly traced back to any one certain event or time or moment, can be viewed as the related events of Christ’s Paschal Mystery combined with the primacy of Peter and culminating with the descent of the Holy Spirit upon the apostles at Pentecost, the graces and eternal benefits of which are bestowed upon those who have fought the good fight in every time and place. We may be asking more questions than can be answered here. Yet we can be sure that the Church did, indeed, begin. And, just as importantly, the Church continues to exist because of Christ’s enduring promises: “…and the gates of hell shall not prevail against it” (Mt 16: 18); “And behold, I am with you always, until the end of the age” (Mt 28: 20). The effect of Christ’s ministry on earth, with His death, resurrection, and ascension, enabled us to receive His presence within us. This began at Pentecost. Before Pentecost, His Spirit presence was not available to abide within us. This is probably why Jesus said of John the Baptist that “Among them that are born of women there hath not risen a greater than John the Baptist: notwithstanding he that is least in the kingdom of heaven is greater than he” (Matthew 11:11). Christianity is the presence of Christ’s Spirit within us. Perhaps as an aside, Jean Daniélou holds that there are three covenants that God makes with man: the cosmic, Judaic, and Christian. Each covenant has its proper content, law, and sign through which man in any covenant may attain salvation. Daniélou makes the case that each covenant *subsists* within the Catholic Church insofar as each subsequent builds upon the foundation of the prior (i.e. the content of the cosmic is apart of the content of the Judaic). He also levies the position that the Body (Church) of Christ *subsists* within the apostolic, catholic Church. Given those two points, I would speculate that he would pin the founding of the Church to Pentecost, when the same Spirit who hovered over the waters, visited Abraham and Sarah, and overshadowed Mary at the moment of the Incarnation is sent to the apostles.